Sprites and some quickie tiles for Muckety Mudskipper game concept. She's half land lover, half sea dweller and all missing link! Join Muckety on her quest for the lost DNA strands! set than making a new one. Got the idea from the Jam title and wanted to put my low color sprite skils to the test. Done in Sega Master System palette. Zip also includes a swap to NEStopia_RGB (NES palette variant). 6/08/2018 - Added cave interior, desert, ice and volcano tiles. 7/01/2018 - Added night time, jungle and an assortment of 'semi-solid' platforms. Added cave interior, desert, ice and volcano tiles. Still, there's an economy to these low-color, low-tile count sets that I just love. These are nice ^^ the master system really could've been something if it had games like this. Ahh, probably. The main thing I recall from the master system was mediocre driving games though. It seemed very uninmpressive. Nah, sms had some great titles! There are some gems amongst the collection. It certainly did, but it seemed as if they were more rare than all the 3D games SEGA were pumping out at the time, many of which are quite boring in my opinion. 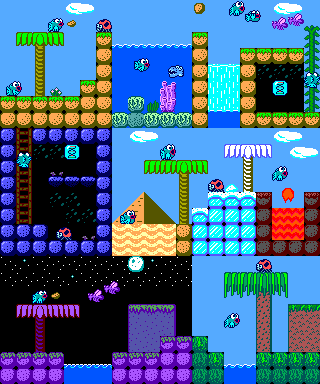 It's game library aside, I'll say the Master System's palette was quite a bit of fun to work with. Very bright, seems almost tailor made for these kind of kid friendly 'blue sky' type games. Weak in some areas and quite a few near redudant colors. Probably not the exact 64 colors one would chose, but not too bad. Definitely a good bit easier to work with than the NES palette. Yeah graphics were probably the only area where the SMS was decidedly superior to the NES. I just feel most of the Master System games from the time lack that "Epicness" that the best nintendo titles had. oh for sure, nothing had the hits like the NES. I think having such a strong Arcade pedigree was kind of double edge sword of Sega with the Master System. Lots of great arcade titles to borrow from, but it also made them a bit slower to produce the kind of deeper, longer-play, more home-console-centric titles that characterized the NES library almost from the start. Still, as has been stated, the SMS Library does have a few surprises in store for anyone who cares to dig deep enough. Ok, deliverying the promised updates! Added some night time and jungle tiles. I also had a go at adding some 'semi-solid' platform tiles. These only appear in the night and jungle previews but I actually made ones for each of the environments. I like how the semi-solid platform bits came out but I must admit they kind of kill that 'low tile count economy' I was talking about. Also not 100% convinced they mix perfectly with the very blocky grid look of the other tiles, but I made them so I figured they were worth including. Hi! I finished the game I was making using these sprites! Unfortunately it doesn't use the new sprites that were added; I love those but I had alomst finished making the last levels by the time they were uploaded and I'm a bit too lazy to add more right now haha. @Lightwatch: Can repost the link? it seems to be missing from your comment for some reason. @Lightwatch: No worries. Game is great! What fun to see these sprites come to life! I'd say you got pretty close to exactly what I was thinking of in terms of gameplay. I like the level designs, nice and big with an emphasis on exploring vs. pure action. 1) The jump is very 'sproining' if that's a word. Muckety shoots up quick, but snaps back down just as quick. Two things to try: use a lower gravity and a lower initial jump velocity. That'll make for a loftier jump. You really want to emphasize time spent at the the 'crest' or top of the jump, that's what feels best for the player (at least for this kid trained on years of Mario ;) You might also try capping the downward velocity. That's another trick I've used before. It violates all laws of physics but it tends to feel better, gives the player more control about where they land. Or at least, more of a feeling of control over where they land. 2) There seems to be a tremendous lag between when you press Z and when Muckety actually spits. Is that intentional? Well, just some thoughts, game is very cool as is, thanks so much for sharing it with everyone! gotta try this game I guess! I have to agree with withthelove on the delayed attack. The jump I find works well enough. Thanks for trying it! I'm glad you like the levels; level design is definitely an area that I feel I need to work on. There is actually a terminal falling velocity, I think it's just not small enough to notice most of the time. I will keep the suggestions about gravity in mind for future games, thanks. Extending the peak of the jump is a good idea. There is supposed to be a delay between when Z is pressed and a mudball is fired. It's supposed to be as if Muckety is sucking in mud and air before shooting it out, though I probably should have added a sound effect to signal this. I'm going to make some adjustments to the page's description clarifying some things. Thanks again, and I'll add space as a jump button!